ASSOCIATED-REDIFFUSION LTD. is the result of the conjunction of two major enterprises in different fields of our national life: Broadcast Relay Service Ltd., with a long and valuable experience in sound broadcasting at home, in the Dominions and in the Colonies, whose Chairman and Managing Director, Mr. John Spencer Wills, M.Inst.T., is Chairman of the new company; and Associated Newspapers Ltd., who have built and maintained an unrivalled pioneering tradition in newspapers, whose Managing Director, Mr. Stuart McClean, is Deputy Chairman. Our General Manager is Captain T. M. Brownrigg, C.B.E., D.S.O., R.N. (retd. ), who after a gallant and distinguished career as a naval officer, was the first general manager of the New Town of Bracknell in Berkshire, where he achieved a notable success in creating good relations between the local community and the newcomers. Our controller of programmes and production is Mr. Roland Gillett, an Englishman who, after sixteen years in films both in Britain and in Hollywood and wartime service in the Fleet Air Arm, became one of the leading television producers in the United States. On foundations which we know to be sure we are launching what we believe to be a pioneering enterprise. Ours is a venture which all concerned enter with zest, with pride in having so magnificent a chance, and with faith in our own capacity to create and sustain—in an entirely new field—a public service which will be second to none. We are neither timorous nor apologetic about what we are undertaking from to-night onwards. We believe — with all the vigour and seriousness we possess — in the new policy which Parliament has approved, which we to-night have the honour to initiate. We believe that television can and will prove to be one of the most significant and exciting developments in human communication — in education, in entertainment and in the visual arts — since the invention of printing. Believing as we do in the principles of competition and free enterprise, it is by the methods of competition and free enterprise that we intend to develop Britain’s new television service. We have neither the need nor the desire to imitate television in other countries; and, in that spirit of rivalry which has been the breath and stimulus of life in Britain for centuries, we welcome competition and we shall strive, in everything we undertake, to give a far better service than our competitors. That, in simple terms, is our task and our aim. “You can never plan the future by the past,” said Edmund Burke. We know that we are facing the challenge of a new age. We know that we must adventure and explore. Television means the act of far-seeing. We shall try to create our contribution to to-morrow, we shall try to build to-day’s bright window into the future, with to-morrow’s methods and technique, and with to-morrow’s aspirations, dreams, hopes and ideals. In the homes and by the hearths of to-day, with new vision founded on our traditional national values and faith, we shall strive to serve the Britain of to-morrow. HERE is TV Times No. 1 — a new paper heralding the opening of a sparkling new era in home entertainment. Television is at last given the real freedom of the air. The event is comparable with the abolition of the law that kept motor-cars chugging sedately behind a man carrying a red flag. Now it’s the “go” signal, the green light for TV, too — with no brake on enterprise and imagination. So far, television in this country has been a monopoly restricted by limited finance, and often, or so it has seemed, restricted by a lofty attitude towards the wishes of viewers by those in control. That situation now undergoes a great and dramatic change. Viewers will no longer have to accept what has been deemed best for them. They will be able to pick and choose. And the new Independent TV programme planners aim at giving viewers what viewers want — at the times viewers want it. Standards will be raised by this new competitive spirit — with new opportunities for artistes, for writers and producers, and for technicians. Famous showmen like Jack Hylton and Val Parnell will present on the television screen, as they now do on the stage, the highest paid stars of this and other nations. Such programmes will bring all the star quality of Command Performances into your home. Also Independent TV really is… independent. It is independent of the advertising techniques used in America. Advertisements fit into the new British TV programmes just as they do into the pages of our newspapers and magazines. They will not detract from your pleasure. Indeed, they will enhance it by combining information with entertainment. So this, then, is the exciting prospect which comes with the advent of the new TV. And at a cost to a viewer of no more than the initial expense of converting or renewing the set and aerial already at home. 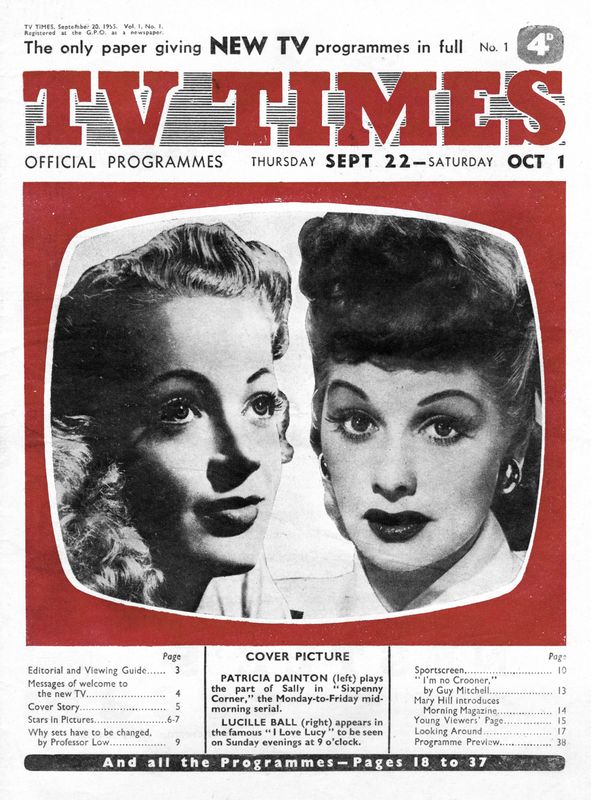 TV Times, official programme paper of Independent TV, will be your guide to better viewing. Each Friday TV Times will publish exclusively full details of the programmes for the week ahead. It will also be packed with stories and photo graphs of your TV favourites. In this, our first issue, we extend a warm welcome to readers, and we confidently believe that as the new television grows into a nation-wide service TV Times will become a friend welcomed every week in increasing millions of homes. THE mews cottage in Kensington has a colour scheme in white, yellow and black. Decor is by Dainton. For Mr. Williams is married to 24-year-old film and stage actress Patricia Dainton, who is to portray the young housewife, Sally Norton, in Britain’s first daily TV serial, Sixpenny Corner. Scottish-born Patricia is a young housewife herself and has a 13-month-old daughter, Tetrina. The fictional Sally is warm, pretty, likeable, with a bubbling personality. So is Pat Dainton, who is undismayed at the prospect that her own identity may become submerged in the character she is to play in the serial, which will be screened five mornings a week. “I shan’t mind even if people always think of me as Sally Norton and not Patricia Dainton,” she says. The life, love and tribulations of newlyweds Bill and Sally, will be a human, true-to-life story set against a dilapidated garage (Sixpenny Corner) which Bill manages in the town of Springwood. Bill and Sally live in a bungalow near the garage. HOWARD PAYS is Bill. He does not resemble Mr. Williams. At 12 Pat Dainton sold newspapers to earn 5s. a week pocket money. At 17 she was a film starlet. LUCILE BALL is unquestionably the first mother to have made a million out of TV. And the first actress to have had a baby on the date laid down in a TV script. The million will be multiplied, because “I Love Lucy” has been the top TV favourite in America for four years with more than 40,000,000 people enjoying its weekly romps. And the contract, due to end this year, guarantees Lucille and her husband, Desi Arnaz, over £3,000,000 for their TV shows alone. In American shops you can buy a wide range of gifts sponsored by “Lucy Rickardo” — the character Lucille Ball has made famous. The nursery furniture followed the birth of Lucille’s son, exactly as provided in the script. As soon as Lucy and Desi knew that they were going to have a second child, the story line of “I Love Lucy” was changed to fit the circumstances. On 13,000,000 TV screens “Lucy Rickardo” went into hospital one January evening and had a baby boy. Next morning all America read in the newspapers that Lucille Ball had had a baby boy, weight 8 lbs. 9 ozs. And TV only claimed it as a coincidence that both were boys! Now Lucy Rickardo and her husband Ricky come to Britain to cheer our Sunday evenings. THE orange-haired actress spent years in Hollywood struggling for fame. Then she met Desiderio Alberto Arnaz y de Acha III, a Cuban band leader. They fell in love. Lucille flew to New York and they were married at five a.m. In four months “I Love Lucy” was at the top of the “View Parade.” There it has been pretty well ever since. Lucy’s income now tops £10,000 a week.